Easily one of the nicest Lake Houses in the area and one of the nicest Lake houses we’ve ever had for sale. Total outdoor living with this house, patios, salt-water pool over looking Cedar Creek Lake. AMAZING, seriously AMAZING views overlooking premier trophy bass lake Cedar Creek Lake, a Kentucky lake! If I told you how big the bass are, you’d call me a fibber! 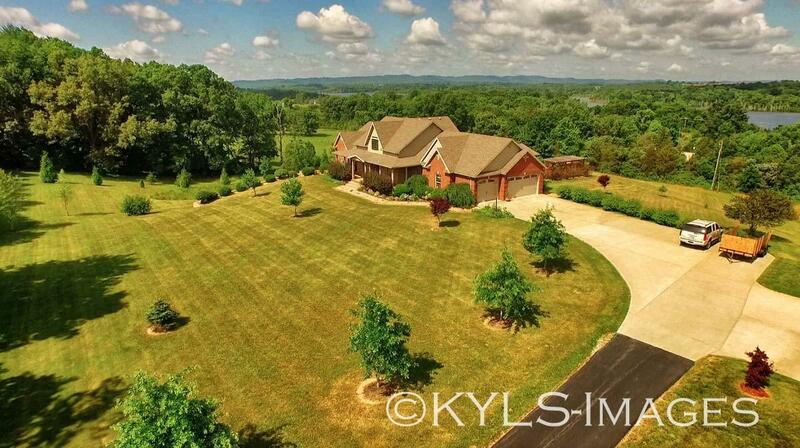 Forget fishing for a sec, If you have dreamed of living in an upscale country home, here it is. Gaze out the wall of windows in your great room and you’ll find an exquisite Saltwater pool with fountains…heated of course. Entertain or relax under the a large covered veranda, adjacent to the private outdoor dressing rooms. Throw in a hot tub for good measure and combine it with the tremendous views and you have a dream! The great room loft offers tremendous opportunity for an office, workout area or secondary living space. The center island kitchen layout is open and functional, with several possible configurations. The Formal Dining room makes for a nice dinner party. Master suite and two additional bedrooms on the main floor with an additional bedroom in the Walkout basement. Which also includes a game room and additional storage space. Must see! call Ken ASAP to view this property 859-494-5521 Cedar Creek Lake House for sale – Overlooking 800 acre Cedar Creek Lake. Cedar Creek Lake is the second largest state-controlled lake in Kentucky Lake info. Cedar Creek Lake also features a larger than usual 300-foot (91 m) buffer zone to prevent private land encroachment problems. Cedar Creek features 3 boat ramps and a public beach – it is slated to be the economic and recreational crown jewel of Lincoln County. Outdoor Living beauty. Cedar Creek Lake House for sale — call Ken ASAP to view this property 859-494-5521 #CedarCreekLake #LakeHouse #LakeHouseForSale [ois skin=”1″] You might want to get you in our Exclusive Mailing List, so we can send you your PERFECT homes and land – and farms the second they are for sale (not when they hit the MLS). go to “Your Perfect Property” at https://bluegrassteam.com/homefinder/ – it only takes a few seconds to fill out your needs and wants and we will start sending you properties that meet YOUR criteria. You’ll be 1st to know about properties – It’s like a sneak peek – before they hit the market – sent right to your inbox. I would venture to say that you are here today at this VIDEO of Cedar Creek Lake House for sale – a Kentucky Lake House, with me because you like unique and unusual properties, that’s why so many people are on our mailing list. If you’re not on our mailing list, click right here and get on our mailing list, you will get at least several days, sometimes a week, week and a half notification on properties like this before the general public, before it hits the MLS. Where are we today? We’re at Howard’s Haven, this is spectacular! First of all, you’re not on the lake but you are lake view, so there’s really nothing between you and the lake and I’ll show you that later, but do you see the lake out there? It’s a 800-acre trophy fishing lake, and I’ll put more information about that right here at the bottom, but as you can see this is a spectacular estate home, no goofing around. Now this is an enclave that comes back here and I’ve showed you, or I will show you coming up the driveway, so you see what’s going on. The highway’s out there, you come up, there’s three houses, a beautiful home here…nothing wrong with that…a beautiful home there, nothing wrong with that; and then what I consider the crown jewel of this enclave – this Kentucky Lake House for sale. This is four bedrooms, three and a half baths, and I don’t know what the square footage is but I’ll put it here. It’s on five acres and it is just beautiful. Now they’re just putting in this…this dog fence stuff, what do they call it? Pet-safe or something like that, they’re just putting in that dog fence, so you’ll have that here already around the whole doggone deal, I mean it’s like really far, so if you got dogs like mine who like to snoop around and nose around they’re plenty safe here, you’re way off the road and you’re close to the lake. Alright so what is the lake? Well there’s a beach, there is a boat ramp, what else is there? Trophy fishing, it was stocked by the State with bask…trophy bask, when they put them in they were huge already, I’ll put that here as well. And then you’re just about six or seven miles to Stanford, and another probably eight or nine miles to Danville, you’re not too far from Lake Cumberland, I’ll put that here, and then you’re just so many miles to Lexington…and you’re so many miles to Lexington. I’ll put pictures of the boat ramp here, which is fantastic. Now there’s two, there’s the main boat ramp which is kind of behind this house, you really can’t see it too well; and then there’s one clear on the other side of the lake, I’ll put a picture of both of those on there, and you can fish off of those, course in Kentucky is like a lot of other States, if the kids are under 16 they don’t even need a licence, so you can go fishing with kids and grandkids, no worries. You’ve got the boating here, you’ve got the beach, I’ll give you a picture of that as well. There’s not a lot of publicity on this lake that’s why it’s so quiet and nice. Anyway it’s pinking out there too, 800 acres is a lot of water. This has a full walk-out basement, I’ll put here about the whole walk-out basement and all this retaining wall which is in stone, and notice that it’s at a pack here okay, and it’s pointing this way, which makes it really stable so this is going to stay back you know when you do these retaining walls sometimes they get a little tippy, not this one, it’s got this pack, I’m sure it was poured and then it’s got stone facing on it as well. Spectacular place with a pool, the views are amazing, it was built properly to maximize those views, you’re going to love this unique property. Now here we are, when you just pull up, okay my truck’s here and the seller’s truck is there, when you pull up you’ve got an incredible view of the lake as you can see; and there’s the sportsman’s club nearby and all that stuff, I’ll give you all the links to all of that information when you want to come and see it, Ken will be glad to show you that property. Just before I was standing back there in that corner, see there’s…just beautiful, you’re high and dry, real high up on the hill, see how high you are here, so never have any kind of water issues or anything. So you’re on the lake but you don’t have to put up with the BS because you’re not on the lake, you don’t have all the noise, you just get to see the beautiful lake and the boaters and all that stuff, which is what makes being on the lake fun. Anyway, great pebble tech porch here, it’s huge, all brick, it’s got the coins, it’s got the keystones, it’s got soldiers above the windows, very well done. Take you inside, let’s go. Alright let’s make it happen. Wide board oak floors…this is…when you walk in the house, this is what you see, I mean seriously…fireplace over here, I’ll tell you all about that stuff later, you want to see the view don’t you? I know you do, you’re like me, you like the views. That is a salt-water pool, how cool is that? I just like the whole idea of it, without swimming in all those chemicals, but I can tell you that’s a preferred way to run a pool, salt water. There’s a huge deck, huge patio all around, there must be $30,000 worth of concrete back here, I have no idea. Anyway let’s take a look at this living room. Floor-to-ceiling windows, and they go up, I’m going to venture to say that that’s 12 feet…we’re over here…yeah cause that’s almost seven, so that’s about five…almost 12 feet there, and then it goes up another gee whiz, maybe eight feet on top of that, so what are we looking at? 18 foot ceiling maybe? You’re here with me because you like unique properties, you like to look at properties, maybe you want to move, that’s why you’re here, I just love sharing this with you. Sounds corny and I don’t mean to sound corny, I don’t want to sound like one of those guys…but you got gas locks there…and look in there. I’m going to take you outside, it’s a little chilly outside right now, but it’s not too cold. Big oak staircase with a hand-wrought iron with the little…what do you call those? Baskets or whatever, those woven baskets in iron, very nice. We got a gym set up there, you could have really…you could have guest room up there, office, whatever, with views on the lake, oh my gosh. Okay, let’s just walk right in here, and this is the master bedroom and these are the views out here. Sliding door here, so you got a triple and this one slides. And then you got a big… big closet over here, this is the neatest walk-in closet that I’ve been in in a long time…and then there’s storage up there of course. And then this is, I’m assuming that’s porcelain tile, absolutely beautiful, it looks like stone, and these beautiful vanities with the pewter…pewter fixtures, so you got his and hers vanities and a shower for two, or three or four…that’s the double sink. Here’s…here’s the hot tub, look at that, hot tub’s right off the master bedroom. Let me run you upstairs, let me run you upstairs real quick…there you go. I kept to the top so you won’t meet…this is really big, I don’t know how many square feet this is but I’m going to guess it’s like maybe 300 square feet? If I know I’ll put it here, if not, you can ask Ken. And look at the views out this way, we’re all about the lake, but look at the views this way. There’s that walk-out basement, there’s the driveway. So you got a full office here and then a full gym and then maybe a pull-out coach, you got a whole sectional thing going on here or three pieces, or whatever you call that, I’m not in the furniture business but I do know properties and I do know what you want and what you like, and I know you’re going to like this place. The price is right as well, for the square footage it can’t be beat, people just moved in, few months later they get transferred, absolutely frustrating for them, delightful for us, not to see neighbors go but for us to be able to offer a property like this to our mailing list. If you’re part of our exclusive group that’s going to get information on this first, can you imagine…that’s pretty nice, pretty sweet…you’re going to get info on this before it hits the MLS. Look at this with the stone tile and all that sort of thing, and this is a …maybe like silo stone or something, I don’t know the difference between granite and corks and silo stone and all that stuff but I can tell you, that’s the real deal, this is too. And it’s got all things that you want today, it’s got the garbage…the pull-out garbage thing, it’ s got the beautiful stainless steel dishwasher, it’s got all that jazz. That’s a stainless steel convection oven, I’m a cook, I love convection, if you know convection you know what you’re doing. And look how big this thing is…this is a huge kitchen. It’s got a three-car garage which I like, one of these days I’m going to have a garage. Show you the dining room here, it’s right off of the foyer so if you’re entertaining, people come…there you go…it’s a big dining room, it’s painted…it’s dark green, like a hunter green or a loden green, which is beautiful especially being around the lake and the whole kind of cabin kind of thing, but it’s bigger than it looks and it would show bigger with a lighter color, I don’t want you to think it’s small because this is not a small dining room. So many times you see a dining room, they have the table, they have the wall there and wall here and can’t even put in a hutch, look at this, the way this floor plan is, you’ve got everything and plenty of room. And then right off the dining room here is a little pocket door, they got some pocket doors here which is very cool, it’s in a half bath…pebbles in the sink… more huge tile, I’m assuming again porcelain, it looks like it is as opposed to ceramic, the porcelain is a lot better, really a lot better. Then there’s the three car. Alright let me take you down and show you the other bedrooms…four bedrooms…then this is the next bedroom which is very nice… vaulted ceiling, very vaulted, how cool that is. And again, nice big double closet, and then Hollywood bath, what do you call it? I call it Jack and Jill or maybe a Hollywood. Again, beautiful vanities, beautiful pewter or nickel fixtures, and then you’ve got full walk-in shower here again, how nice is that? That’s what everybody wants today, that’s what everybody asks for, well that’s what we got here, beautiful, nice and clean. Let’s run downstairs and I’ll show you what we got going on in the basement. Love a house with a basement…I’m going to show you that later. Yet another bedroom, a fantastic bedroom, actually this is big enough you could have two bedrooms in here, maybe you should have two bedrooms in here, maybe you need two king beds, this is a king bed and it’s completely lost in this room cause this room is so gihugic. This goes right out…this is the walk-out part with the basement, it’s own bath down here…sweet huh! Walk-in closet…nice walk-in closet, big… and then the man cave, the lady cave, the family cave, the home theatre, whatever you want to call it, check this out…wow! Can crank up the stereo down here and let it fly. So I’m wondering what these curtains are right…which are actually really nice. Well that’s the concrete…it’s the poured walls right here painted dark and then put up with these curtains here, which gives it a full theatre…full-on theatre look, it’s really nice. Alright, here we go, my kids’ favorite, maybe your kid’s favorite too, a simple life…wow! This is so cool! Is this the coolest or what? It’s got a chair there…that’s a big pool table… So that’s poured concrete, all poured concrete…no, not that side, that’s sheet rock, this ain’t sheet rock. Wow! Beautiful! Okay, so that was the basement, just fantastic. This house is all about recreation, playing, et cetera. Come on let’s go outside real quick, I’ll show you around the back, you can see the still shots too. So this opens, and this guy opens, so now you’ve got a full five or six feet there which is oh so sweet if you entertain a lot, you know how people come and go, come and go right? So you know how important that would be to have that. Very nice. Then look at the size of this rascal back here, I mean truly there is a lot of concrete. There’s a lot of concrete just in those steps, then you’ve got everything else. So you got the grill here, you got smoker, you got another grill…this is my kind of guy. And then this is wonderful, this changing room thing, so you could throw a head out here and have a shower, but this is for changing right at the pool. So again, all about recreation, all about living outside, all about the lake, and yet you’re close to everything. So you know, you can have these great properties but if they’re so far away…and we’ve had those too, and I’ll tell you, it’s out there and that’s what you may be looking for, if you just want to be five to 10 minutes to shopping, this is it. And then of course you’re still quote/unquote “out there”…look at this, you’ve got cows for neighbors, they make good neighbors, let me tell you. Now I don’t know all about all this stuff but there’s three compressors there so I’m assuming it’s like three zone heating, and then there’s a heater behind here with the filter and all that stuff so I’m assuming it may be heated, and you got to talk to Ken. If I’m wrong I’ll put it here. Are you excited? I’m excited, I want to show you this house. Call our number down here, get Ken to bring you out here, I’m excited for us to show you this house. The number right here is for Ken, give him a call, he knows all about the property, he’ll bring you out here, he’ll tell you all about it. It’s hard to videotape and watch where you’re walking at the same time – VIDEO of Cedar Creek Lake House for sale. This is huge, I mean this has got to be 20…20 by 20 just this part here, this covered part, oh my gosh. Beautiful beautiful place, very excited that we’ve got this, very excited that we’ve got this listing, come out and see Howard’s Haven. Give Ken a call and get on our mailing list, you’ll love it, you can back out anytime, one click it’s unsubscribe, and of course we don’t share your information with anybody, why would we do that? Who’re we going to share it with? Our competition? It’s just me and Ken and my wife and a couple agents, we’re never going to share your information with anyone. Get on the mailing list right here. Tell us what you want, what’s the ideal property? What your perfect property looks like. Maybe it is this Kentucky Lake House. Thanks so much for watching, really appreciate you.